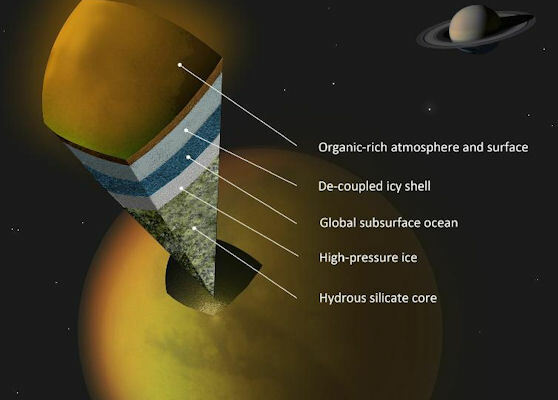 June 28, 2012: Data from NASA's Cassini spacecraft have revealed Saturn's moon Titan likely harbors a layer of liquid water under its ice shell. The finding appears in today's edition of the journal Science. The evidence is tidal. Saturn's powerful gravity stretches and deforms Titan as the moon moves around the gas giant planet. If Titan were composed entirely of stiff rock, the gravitational attraction of Saturn should cause bulges, or solid "tides," on the moon only 3 feet (1 meter) in height. Instead, the data show Saturn creates solid tides approximately 30 feet (10 meters) in height. This suggests Titan is not made entirely of solid rocky material. At first, scientists were not sure Cassini would be able to detect the bulges caused by Saturn's pull on Titan. Cassini succeeded, however, by measuring Titan's gravitational field during six close flybys from Feb. 27, 2006, to Feb. 18, 2011. These gravity measurements, collected with the aid of NASA's Deep Space Network (DSN), revealed the size of Titan's tides. "We were making ultrasensitive measurements, and thankfully Cassini and the DSN were able to maintain a very stable link," said Sami Asmar, a Cassini team member at NASA's Jet Propulsion Laboratory in Pasadena, Calif. "The tides on Titan pulled up by Saturn aren't huge compared to the pull the biggest planet, Jupiter, exerts on some of its moons. But, short of being able to drill on Titan's surface, the gravity measurements provide the best data we have of Titan's internal structure." An ocean layer does not have to be huge or deep to create the observed tides. A liquid layer between the external, deformable shell and a solid mantle would enable Titan to bulge and compress as it orbits Saturn. Because Titan's surface is mostly made of water ice, which is abundant in moons of the outer solar system, scientists believe Titan's ocean is likely mostly liquid water. On Earth, tides result from the gravitational attraction of the moon and sun pulling on our surface oceans. In the open oceans, those can be as high as two feet (60 centimeters). The gravitational pulling by the sun and moon also causes Earth's crust to bulge in solid tides of about 20 inches (50 centimeters). The presence of a subsurface layer of liquid water at Titan is not by itself an indicator for life. Scientists think life is more likely to arise when liquid water is in contact with rock, and these measurements cannot tell whether the ocean bottom is made up of rock or ice. The results have a bigger implication for the mystery of methane replenishment on Titan. Methane is abundant in Titan's atmosphere, yet researchers believe the methane is unstable, so there must be a supply to maintain its abundance. "The presence of a liquid water layer in Titan is important because we want to understand how methane is stored in Titan's interior and how it may outgas to the surface," said Jonathan Lunine, a Cassini team member at Cornell University, Ithaca, N.Y. "This is important because everything that is unique about Titan derives from the presence of abundant methane, yet the methane in the atmosphere should be destroyed on geologically short timescales." 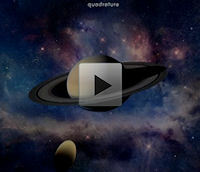 For more information about Cassini's mission to Saturn, visit: http://www.nasa.gov/cassini and http://saturn.jpl.nasa.gov .